CIMAM offers around 22 travel grants to support the attendance of contemporary art museum professionals to CIMAM’s 2019 Annual Conference The 21st Century Art Museum: Is Context Everything? that will be held in Sydney, Australia 15–17 November 2019. Generously supported by The Getty Foundation, Adam Mickiewicz Institute, Alserkal Arts Foundation, V-A-C Foundation, and Byucksan Foundation, CIMAM’s Travel Grant Program supports individuals’ curatorial and research development through their attendance at the Annual Conference where the most current concerns on contemporary art practices are being discussed. Awarded candidates benefit from unique networking opportunities through interaction and exchange with international museum directors and peers. Travel grantees become Members of CIMAM for the triennial they have been awarded. Deadline to apply is 5 May 2019 at 24:00 CET. Grants are restricted to modern and contemporary art museum or collection directors and curators in need of financial help to attend CIMAM’s Annual Conference. Researchers and independent curators whose field of research and specialization is contemporary art theory, collections and museums and most of their field of professional activity is related to the functions of an art museum, are also eligible. Applicants should not be involved in any kind of commercial or for-profit activity. While professionals of all career levels are encouraged to apply, priority is given to junior directors and curators (less than 10 years’ experience). Candidates who have previously received CIMAM grants from the same grant contributor may only be considered for a new grant after 3 years since the previous grant was awarded. Supports professionals residing in countries with Emerging Market and Developing Economies according to the International Monetary Fund’s World Economic Outlook. Supports contemporary art professionals residing in Poland. Supports professionals residing in or whose practices relate to the United Arab Emirates and the wider Middle East and North Africa region (Algeria, Bahrain, Djibouti, Egypt, Iran, Iraq, Jordan, Kuwait, Lebanon, Libya, Morocco, Oman, Saudi Arabia, Syria, and Tunisia) and the South Asian countries (Afghanistan, Bangladesh, Bhutan, Maldives, Nepal, India, Pakistan, and Sri Lanka). Supports professionals residing in Russia and the countries of the former Soviet Union (Armenia, Azerbaijan, Belarus, Estonia, Georgia, Kazakhstan, Kyrgyzstan, Latvia, Lithuania, Moldova, Tajikistan, Turkmenistan, Ukraine, and Uzbekistan). Supports professionals residing in the Northeast Asia region (Republic of Korea, China, Japan, Taiwan, Hong Kong, Macau, and Mongolia). The support is limited to cover conference registration*, travel expenses (round trip economy flight tickets only) and 4-night accommodation in one of the hotels recommended by CIMAM (check-in 14 y check-out 18 November 2019). Distribution of funds is set on a case-by-case basis for each recipient. CIMAM books and pre-pays all expenses directly (travel and accommodation) avoiding reimbursements to any grantee. Funds do not cover transportation to/from the airport, visa expenses, travel insurance and registration to the optional conference tours. *Conference registration includes access to all conference sessions, lunches, dinners, access to organized visits and coach service to and from planned visits. Candidates are invited to complete an online application form and include a CV and short résumé, a motivation statement and two letters of recommendation by professionals or scholars who are familiar with the candidate’s qualifications. 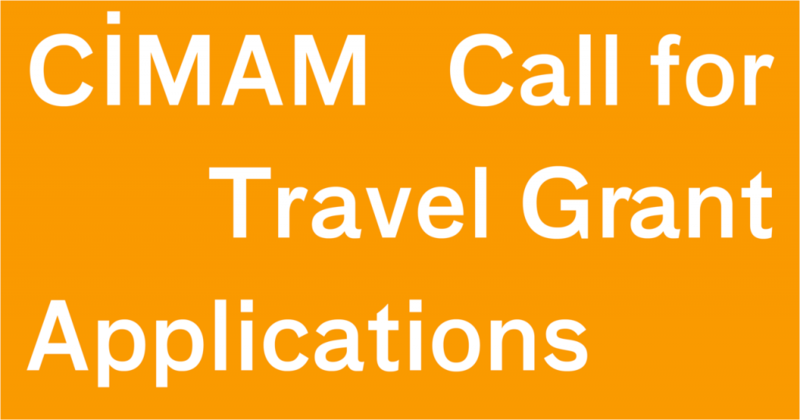 Travel grant applications are evaluated and conferred by CIMAM’s Travel Grant Committee, composed by members of the CIMAM Board, and the Getty Foundation. Grants are conferred based on the assessment of the candidate’s genuine financial need, the potential benefit to his/her development and/or research and the relevance of field experience in relation to the objectives of CIMAM. When accepting the grant, each successful candidate is invited to submit an online acceptance form and to agree to the grant’s Terms and Conditions. – 5 May: Deadline to submit applications. – 28 May: Beneficiaries are informed. – 10 June: Deadline for beneficiaries to accept the grant’s terms and conditions. – 30 June: Announcement of beneficiaries. – 1 December: Deadline to submit written reports to CIMAM.